Gable-Mount Power Attic Vents - Air Vent, Inc. It's electric powered and uses a thermostat and humidistat control to help prevent heat and moisture buildup inside the attic. Installed in the gable end of the house, the Gable-Mount Ventilator operates 30% more quietly than comparable units and with 35% greater efficiency. What's more, since many homes already feature a gable or vent, it may not be necessary to cut a hole to install the gable-mount ventilator. 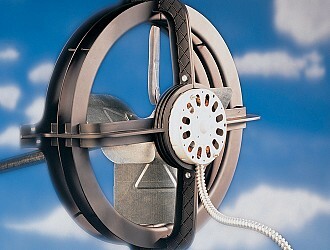 Air Vent’s gable-mount power vents operate 30% quieter and 35% more efficiently than comparable units. The fan blade is encased in a patented series of rings – not a cylinder like standard units. This open ring configuration allows the fan motor to move air more efficiently and with fewer restrictions. 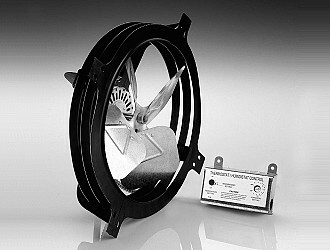 A shutter (Model SHT15W, sold separately) opens automatically when the fan turns on to allow the unit to exhaust efficiently. The shutter can be painted to match the home’s exterior. 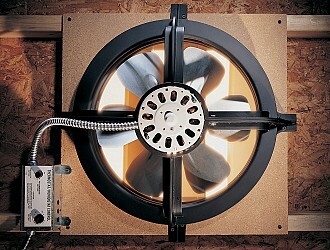 A shutter (Model SHT15W, sold separately) opens automatically when the fan turns on to allow the unit to exhaust efficiently. The shutter can be painted to match the home’s exterior.A gable-mounted power fan is installed in the gable end of the attic. 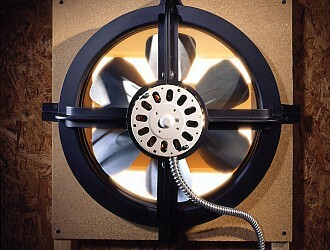 Some homes already have gable end vents or louvers there, making it easy to install a powered fan at that location. Just like any exhaust vent power vents need intake airflow to perform properly. To calculate how much intake the power vent needs simply divide the fan's CFM capacity by 300 and then convert that number to square inches.